It is relatively straightforward and easy to litter train rabbits, it's certainly not complicated though some patience will be required. Rabbits are very clean by nature. In the wild they always relieve themselves in the same spot and they don't go in their burrows. Their natural instinct is to use one area as a toilet and, generally, this will apply to a domesticated rabbit as well. When attempting to litter train rabbits it may help to know that it can be done with more reliability than with a cat. Rabbits naturally pick one, maybe more, toilet areas and you need to take advantage of this in litter training. To begin with, it is best to litter train your rabbit as soon as you have brought them. When you buy a baby rabbit, the youngest it should be is 8 weeks, so whether it is a baby or an older rabbit, start as soon as you get them home. The reason you need to train a rabbit as soon as you get them home, whether it be a baby or not, is so the rabbit can be conditioned and socialised to a household environment. 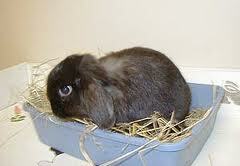 As a rabbit reaches puberty it may start to deposit faeces elsewhere, other than its toilet area. There will be a point in the rabbits growth when you may notice the rabbit running around your legs in circles and probably making grunting noises. This means the rabbit needs to be spayed or neutered. When you litter train rabbits, once they are neutered or spayed, this behaviour will reduce or stop altogether and it will also eliminate the rabbit spraying urine. If a rabbit is kept as a pet then neutering or spaying is essential anyway for several different reasons, which are explained elsewhere on this site. When you litter train rabbits, it will be the rabbit that picks its litter area. You are not really training, more like working with the rabbit's natural instinct. Once this is understood, matters will move along much more smoothly. Start by confining your rabbit to a small area for 48 hours. You can do this in one of two ways. Purchase one of the indoor cages and cover floor with bedding ,newspaper and wood flakes. The rabbit will then gain security in its own surroundings and pick its own area of the cage as a litter area. When this has been achieved, introduce the litter tray to that area. Leave the rabbit in the cage for a further day otherwise if you let the rabbit out into the home it may pick somewhere else as a litter area. The rabbit will associate the tray with the act of going to relieve itself. When the rabbit has the freedom of a larger area, such as the room, the rabbit will come back to its cage to relieve itself. In this way the rabbit will have strongly connected the cage to its litter area. After this stage you should start by limiting the space the rabbit has when it leaves the cage. When you litter train rabbits, to start with and where possible, give the rabbit a treat each time it jumps into or goes to toilet in the tray. By treat it is meant perhaps something you do not usually give, such as a piece of carrot. Or instead give the rabbit a little stroke on the head. If a rabbit has an association of urinating or defecating somewhere when young it can be hard to break so avoid the rabbit relieving itself where you do not want it to go. If you prefer not to start with a cage, then you can initially restrict the rabbit to a small area of the room and do the same process, i.e. when the rabbit decides on its litter area then that is where you should place the litter tray. Increase the area in which the rabbit will be allowed to roam in stages. In this way the rabbit gets used to new surroundings gradually, rather than having a massive area to start with. If you give the rabbit a large area to start with, it may relieve itself all over the place or certainly in a few places. So basically you are putting the litter tray where the rabbit likes to go, to where the rabbit will return to. It may be that you end up with two litter areas, one in the cage and one outside elsewhere in the room/home, depending on how much area you are allowing your rabbit. When you litter train rabbits, a rabbit may still leave a few hard pellets, in different places, from time to time. This is natural and simply the rabbit's way of marking territory. The actual litter tray should be one that suits the rabbit's size. The rabbit will want to sit in the tray with room around them. The tray cannot be too high, otherwise the rabbit may find it too troublesome to get in and out of. Nevertheless it has to be high enough to contain the litter. If the rabbit wont take to a tray, you can try a wooden box. A strong cardboard box can be tried as a temporary measure or you can try a covered litter box like the ones used for cats. An untreated straw wicker basket with the bottom lined with bin liner, or similar may be suitable. A small plastic dog bed, maybe even a pet carrier may work for your rabbit. The actual litter should be paper based and absorbent. You can buy litter especially to litter train rabbits or use safe wood chippings with some hay or some organic material. When you litter train rabbits, Do NOT use cat litter. Do not use pine shavings, Never use cedar shavings which can be harmful. Do not use clay or clumping litters or corncob litter as these will cause blockages if eaten . Place some of the rabbits own droppings and soiled bedding in with the litter. It is important to heed the above since the rabbit will probably nibble on the litter, so it cannot be harmful to the rabbit and must instead be something the rabbit can chew on. Next to the litter tray, place some hay and the food bowl. This will be beneficial since it will enable the rabbit to eat as it deposits faeces, which is common behaviour for a rabbit. The rabbit associates the scent from the tray to where it goes to toilet, so although you should clean it out, do so perhaps every 2 days rather than too often and make sure you leave some scent on tray. Do not let the tray fill up, otherwise the rabbit may look elsewhere. Your rabbit may urinate or defecate in places that you do not want it to. You will need to clean these areas in such a way that the rabbit cannot smell its scent when it goes back to that area. The best way to do this is with white vinegar or warm soapy water. If after washing the area, the rabbit continues to go there, then wash the area again and when dry, try a alcohol spray such as surgical spirit. Be careful what you clean the area with since bleach contains ammonia, as does urine and, of course, the rabbit will simply return to the area and mark the area even more forcefully. If your rabbit jumps on the sofa or somewhere similar where you do not wish it to go, forcibly tell the rabbit to get off or clap your hands and say 'NO', but then give praise or a treat once it has done so, but when you litter train rabbits, or at any other time, never punish a rabbit. It will have the opposite effect to what you are trying to achieve. Obviously if there are areas you simply do not want the rabbit to go to, make that area inaccessible by blocking it off .